This monograph is the culmination of a yearlong inquiry by The Center on Philanthropy and Public Policy at USC into place based work. 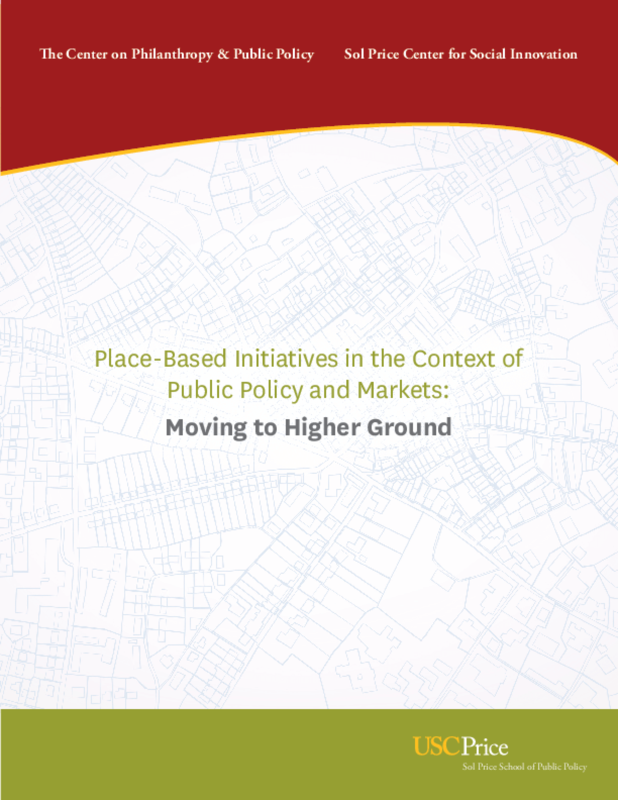 It includes a 50-year evolution of place-based initiatives and a synthesis of the inquiry's conversations with dozens of the foremost practitioners and scholars in the field, many of whom have spent their entire careers working on major philanthropic initiatives or government efforts addressing geographically-concentrated poverty. Among the insights in the report: poor U.S. neighborhoods are not all the same; a single process will not reverse generations of poverty; and public policy must be "place-conscious." National thought leaders also strongly recommend that in order to be successful, anti-poverty initiatives must be "nested" within larger, mutually reinforcing public policies and connected to the market economy; and philanthropic, corporate, and public resources should be "braided" together to achieve scale and impact. It also includes an important statement about the significance of "place-based" strategy by The Honorable Henry Cisneros, former Secretary of the U.S. Department of Housing and Urban Development, along with an illustrative example from Dr. Robert K. Ross President and CEO of the California Endowment, which is in the midst of a ten-year, 14-site, $1 billion place-based campaign in California, and a dozen response essays from a variety of experts across a range of disciplines.